Pitkin Station is labeled. Birney Station is not, but was located at the siding. Meade's Station is labeled. "Shooting Hill" was a dangerous location. Confederate artillery from Reeves Salient attempted to interdict trains here at long distance with little success. "Pitkins Station U.S.M.R.R. 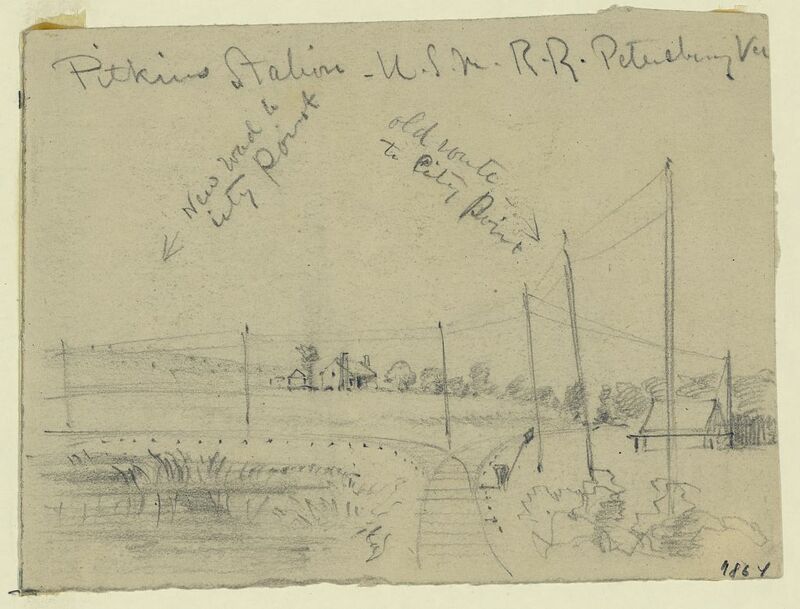 Petersburg, Va." Drawing by A. R. Waud [DRWG/US - Waud, no. 280 (A size)] At Pitkin's Station the military railroad branched from the old bed of the City Point line and headed south. Corps hospitals were frequently located near stops on the U.S.M.R.R. to facilitate movement of the wounded and sick to City Point and for supplies. This Russell photograph illustrates the XVIII Corps hospital near Pitkin's Station. The IX Corps hospital was near Meade's Station. "Birneys Station. U.S.M.R.R. 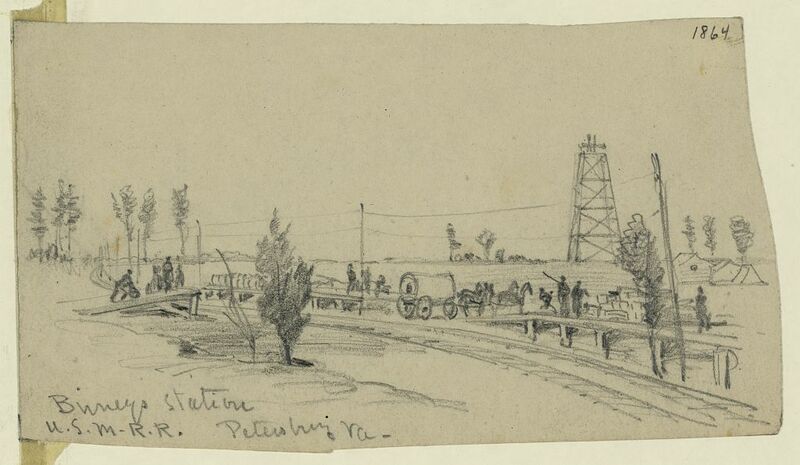 Petersburg Va.," drawing by A. R. Waud [DRWG/US - Waud, no. 441 (A size)] Located halfway between Pitkin's and Meade's Stations. Signal Station in right rear. LC 20118. 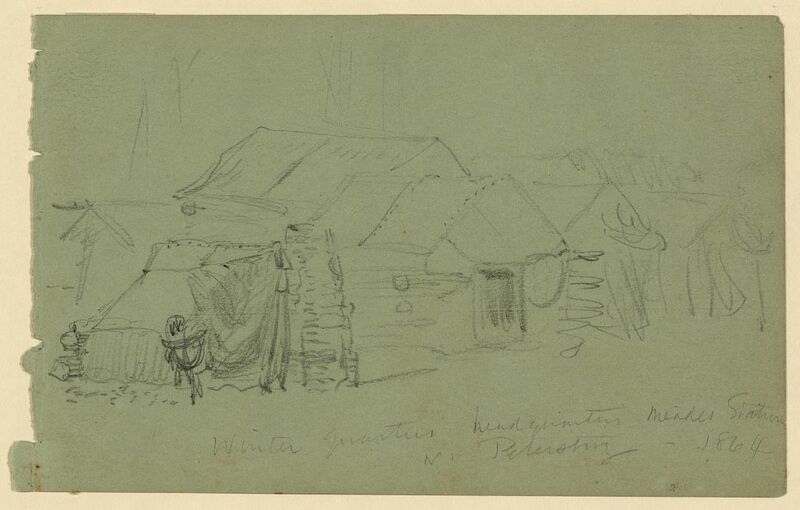 "Winter quarters headquarters Meades Station nr. 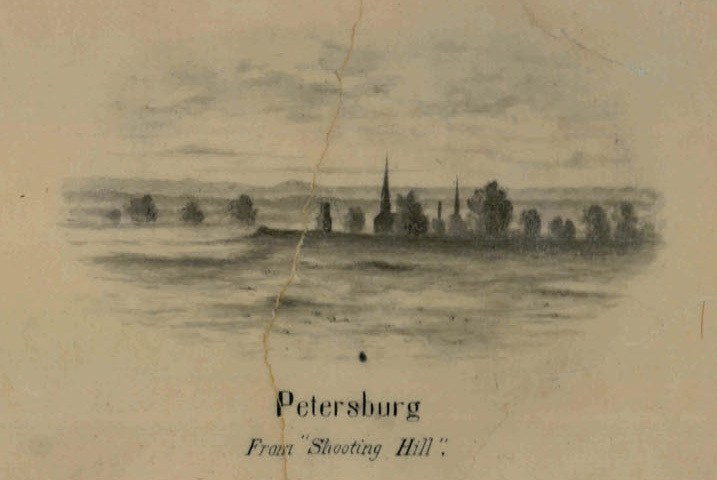 Petersburg--1864," drawing by A. R. Waud. 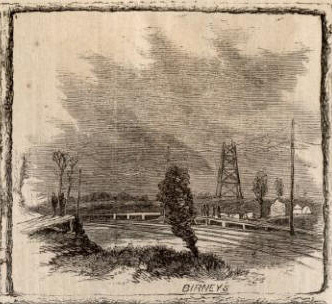 "Birney's Station," from a sketch by A. W. Warren. 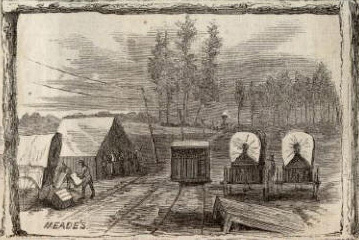 "Meade's Station," from a sketch by A. W. Warren. U. S. Military Railroad -- "Shooting Hill"
Inset from "Map of the City Point and Army Line with its Branches and Connections." NARA RG 77 Rds 196.